We might soon be seeing some major changes to Samsung's TouchWiz smartphone interface, as some recently uncovered patents point to the addition of 'hot corners'. By tapping one of the four corners of the screen a selection of shortcuts will apparently appear, giving users quick access to apps, settings and notifications. Not only would these shortcuts make it quicker and easier to access commonly used apps and features, but they could also make one-handed operation more viable on large handsets. Each corner seems able to house at least three shortcuts, for a minimum of twelve in total, though as the corners resemble dials it's possible that you can turn them to reveal even more shortcuts. 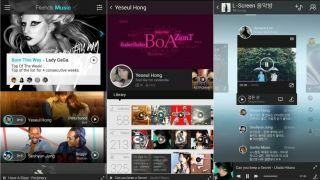 The patents, turned up by GalaxyClub, also suggest that Samsung is working on new social features for its music app, allowing users to share music that they like with friends and comment on other people's shared music. It's unclear if or when we'll see these features in a Samsung phone, but with a TouchWiz overhaul rumoured for the Galaxy S5 it's not unreasonable to think that these changes might feature in the flagship handset too.